First thing Tuesday morning and Intel is showing off it's new Atoms – previously known as Silverthorne and Diamondville, these processors will become part of a new set of brands in addition to the Centrino we’ve seen for the last five years. 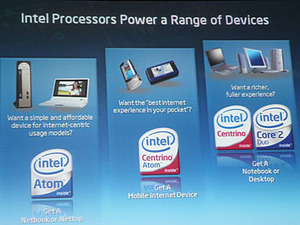 The “Intel Atom” brand becomes the new name for “nettop” and “netbook” products. These new terms will be for future “EeePC-like” devices that provide basic productivity with very low cost and very low power use. Diamondville-based processors will have a slightly higher TDP, but will not be so space and form factor sensitive, however the thermal limit is still far, far lower than a normal mobile Core 2 Duo processor. 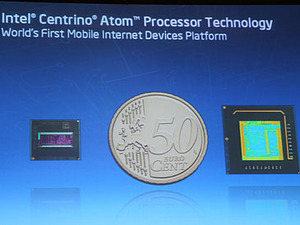 The “Intel Centrino Atom” brand will represent the ultra low power, premium (Silverthorne/Menlow) product that fits into more expensive Mobile Internet Device (MID) products and ultra portables that require very good battery life and a very small form factor. 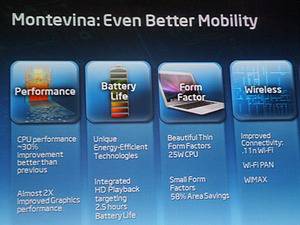 Finally, Intel also announced its “Centrino 2” platform that will arrive with the Montevina refresh in Q2 – this will incorporate a 45nm Core 2 processor, which Intel claims provides “up to ~30 percent performance improvement”, specific small form factor designs for mobile (packaging and core sizes) that give “58 percent area savings”, 802.11n WiFi with the option of WiMAX and improvement management tools with Intel vPro. 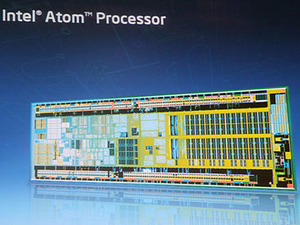 Considering Intel’s success with Centrino we expect the Atom and Centrino 2 to follow suit in a similar vein – more so with the Atom, which should open up far more markets given the EeePC’s success. We were shown an example of the Centrino Atom (formerly Menlow platform) running on engineering sample equipment that was made for a German in-car GPS manufacturer. 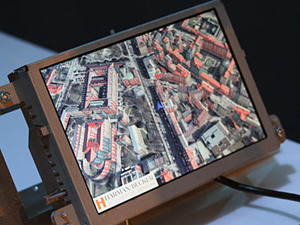 The results were impressive, with the whole city rendered in 3D - though it really hammered home the Atom's limitations when he said that his team “had the most out of this product.” That said, it should offer more in a smaller space – but it didn’t seem all that much more impressive to VIA's Nano processors and platforms in some respects. 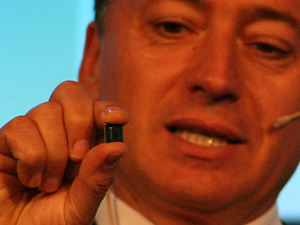 If you're interested in this kind of device from Harman/Becker, you’ll have to wait until 2010 though! 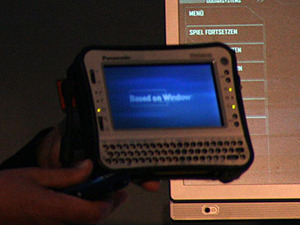 However one of the biggest “Oooo’s” was Panasonic's MID Toughbook – how about rugged and ultra mobile? Exactly what you’d want, right? When you’re half way up that mountain and you need to check your email... it can happen! Jesting aside, it’s arguably the perfect application and having used Toughbooks in the past it should be just as awesome. Do MIDs and the Atom interest you? 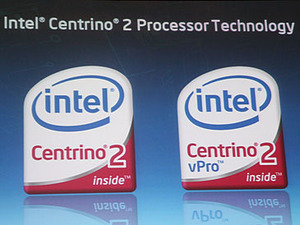 How about Centrino 2 – an upgrade you’re looking forward to? Let us know your thoughts in the forums.